Chronic lymphocytic leukemia (CLL) represents the outgrowth of a CD5+ B cell. Its etiology is unknown. The structure of membrane Ig on CLL cells of unrelated patients can be remarkably similar. Therefore, antigen binding and stimulation could contribute to clonal selection and expansion as well as disease promotion. Initial studies suggest that CLL mAbs bind autoantigens. Since apoptosis can make autoantigens accessible for recognition by antibodies, and also create neo-epitopes by chemical modifications occurring naturally during this process, we sought to determine if CLL mAbs recognize autoantigens associated with apoptosis. In general, ~60% of CLL mAbs bound the surfaces of apoptotic cells, were polyreactive, and expressed unmutated IGHV. mAbs recognized two types of antigens: native molecules located within healthy cells, which relocated to the external cell surface during apoptosis; and/or neoantigens, generated by oxidation during the apoptotic process. Some of the latter epitopes are similar to those on bacteria and other microbes. Although most of the reactive mAbs were not mutated, the use of unmutated IGHV did not bestow autoreactivity automatically, since several such mAbs were not reactive. Particular IGHV and IGHV/D/J rearrangements contributed to autoantigen binding, although the presence and degree of reactivity varied based on specific structural elements. Thus, clonal expansion in CLL may be stimulated by autoantigens occurring naturally during apoptosis. These data suggest that CLL may derive from normal B cells whose function is to remove cellular debris, and also to provide a first line of defense against pathogens. Chronic lymphocytic leukemia (CLL), the most prevalent hematologic malignancy affecting Caucasian adults, is incurable (1). The disease is a monoclonal expansion of a subset of antigenexperienced human B cells expressing surface membrane CD5 (2,3). A key role for surface membrane Ig (smIg) is suggested by their striking structural similarity among unrelated patients (3–5). Furthermore, the presence of somatic mutations in IGHV genes coding the smIg V-regions segregates patients into subgroups (6) with dramatically different clinical outcomes (7,8). Patients with unmutated IGHV (U-CLL) have more aggressive disease (median survival < 8 years), while patients with mutated IGHV (M-CLL) have a milder course (median survival › 24 years). Such observations led to the paradigm that development and evolution of CLL is influenced by antigen selection and drive (3). Therefore, defining the antigens bound by CLL cells could provide insights into the pathogenesis of the disease. Clonal selection can be driven by foreign and self-antigens (9). Apoptosis is a major source of self-antigens, resulting in display of intracellular molecules on cell surfaces (10,11) and generation of neo-antigens by accompanying mechanisms such as oxidation (12,13). B lymphocytes targeting such epitopes frequently are found in the pre-immune repertoire, often in the B-1 cell compartment (14). Because CLL cells likely derive from autoreactive B cells (15–18), we explored if apoptosis-associated autoantigens were relevant to the selection and expansion of leukemic cells in this disease. Our data indicate that smIgs, particularly from patients with poor outcome U-CLL, recognize autoantigens made available during apoptosis and/or created by this catabolic process. These findings suggest that CLL is selected from a B-cell subset that normally helps clear cellular debris and metabolic byproducts by recognition of ubiquitous, conserved autoantigens. Response to this recognition may drive the clonal expansion of leukemic cells, thereby contributing to clinical outcome. Studies were approved by the Institutional Review Board of North Shore-LIJ Jewish Health System in Manhasset, NY, USA, and performed in accordance with the Helsinki agreement. RNA from blood mononuclear cells was converted into cDNA, and expressed IG V regions were sequenced as described (6). GenBank accession numbers for these rearrangements are provided in Table 1. Cloning, expression, and purification of mAbs were performed as reported (19). bNA: Not attributable to a currently defined stereotypic subset (25,26). cMutation (Mut.) status of IGHV: unmutated (U-CLL) or mutated (M-CLL). dPercent mutation of IGHV or IGLV as compared with germline according to IMGT (54). eHCDR3 or LCDR3 amino acid sequences according to IMGT with bold characters indicating non-identical residues among members of the same subset (excluding CLL 014). fGenBank accession numbers for IGH and IGL nucleotide sequences. HEp-2 cell-coated slides (INOVA Diagnostics Inc., San Diego, CA, USA) were incubated for 1 h at 4° C with CLL mAbs (2–200 Mg/mL) followed by FITC-conjugated goat anti-human IgG, 1 h at room temperature. Slides were mounted and visualized with an Axiovert 200M inverted microscope (Zeiss, Thornwood, NY, USA) and analyzed with AxioVision version 4.5 software (Zeiss), or with an Olympus FluoView 300 confocal microscope (Olympus America Inc., Center Valley, PA, USA). Flow cytometry. Fifteen h after induction of apoptosis (y-irradiation, 4000–5000R), 2.5 × 105 human T (Jurkat) or B (RAMOS) cells were incubated with CLL mAbs (50 Mg/mL) for 1 h at 4° C, followed by either FITC-conjugated F(ab′)2 goat antihuman IgG (Southern Biotech, Birmingham, AL, USA) or FITC-conjugated mouse anti-human IgG (BD Pharmingen, San Jose, CA, USA). Samples then were exposed to Annexin V-PE and 7-AAD per vendor protocol (BD Pharmingen). In competition assays, CLL mAbs were incubated overnight at 4° C with MDA-BSA (25-100 Mg/mL) before processing cells as above. Data were acquired using a FACS Calibur flow cytometer (Becton Dickinson Immunocytometry Systems, San Jose, CA, USA) and analyzed using FlowJo software version 7.2.4 (Tree Star Inc, Ashland, OR, USA). Confocal microscopy. Jurkat T cells were incubated with 2 µM camptothecin (Sigma-Aldrich, St. Louis, MO, USA) for 3 h and processed as per Radic et al. (11). In brief, 2.5 × 105 cells were exposed to CLL mAbs (50 Mg/mL) for 1 h at 4° C and resuspended in a mixture of SYTOX Orange (Molecular Probes Inc., Eugene, OR, USA), Alexa Fluor 647-conjugated Annexin V (Molecular Probes), and FITC-conjugated F(ab′)2 goat anti-human IgG (INOVA) for 30 min at 4° C. In other experiments, Jurkat cells (not camptothecin-treated) were fixed (PBS, 6% paraformaldehyde), permeabilized (PBS, 0.1% Triton X-100), and stained as described. Cells were dried on Poly-D-Lysine Cellware coverslips (BD BioCoat, Bedford, MA, USA) and mounted with fluorescent mounting solution (DakoCytomation, Carpinteria, CA, USA). Slides were imaged and analyzed as described. Target antigens were purchased as follows: Ox-LDL (INTRACEL, Frederick, MD, USA), malondialdehyde (MDA)-BSA (Cell Biolabs Inc., San Diego, CA, USA), 4-hydroxynonenal (HNE)-BSA (α Diagnostics International, San Antonio, TX, USA), PC-BSA (Biosearch Technologies Inc., Novato, CA, USA). 1-palmitoyl-2-(5-oxovaleroyl)-sn-glycero-3-phosphorylcholine (POVPC)-BSA was prepared from POVPC (Avanti Polar Lipids Inc., Alabaster, AL, USA) as described (20). Polystyrene 96-well plates (NUNC, Rochester, NY, USA) were incubated overnight at 4° C with 5 εg/mL of each antigen. After blocking with 3% milk, plates were incubated with CLL mAbs (5 and 25 εg/mL) overnight at 4° C, followed by alkaline phosphataseconjugated goat anti-human IgG (Southern Biotech). Assays were developed using p-nitrophenyl phosphatase (Sigma-Aldrich) as substrate. Surveys were performed with a panel of 65 self-antigens selected for relevance to autoimmune disease or because of reactivity with natural antibodies as described recently (21). Briefly, microarrays were printed on nitrocellulose-coated FAST slides (Whatman, Florham Park, NJ, USA) with a QSoft QArray Mini, using QSoft microarray software (Genetix USA, Boston, MA, USA), with six replicates of each antigen. After blocking with What man blocking buffer, slides were incubated with CLL mAbs (2 and 10 εg/mL) or control IgG in PBS, pH 7.4. Slides were processed and data determined as described (21). Independent analyses with duplicate arrays also were performed to confirm the reproducibility of results. Antigens were removed from the final data set if ≤ 3 CLL mAbs were reactive. Significance was assigned for P < 0.05. We expressed recombinant mAbs from 19 U-CLL and 9 M-CLL that utilized IGHV most commonly observed in CLL, 1–69, 3–21, 4–34, and 4–39, as well as others (Table 1). Several mAbs were examples of stereotypic rearrangements that appear to be CLL-specific (22–26). Many CLL mAbs react with autoantigens in solid phase assays (15–18). Therefore, we determined reactivity by standard immunofluorescence with viable HEp-2 cells that subsequently were fixed and permeabilized to permit mAb access to intracellular targets; such cells are utilized to identify autoantigens in autoimmune disorders such as systemic lupus erythematosus (SLE). All 28 CLL mAbs bound HEp-2 with varying efficiencies; some showed unequivocal binding at 2 µg/mL (for example, No. 114), while others required 100–200 µg/mL to discriminate binding above background (for example, No. 412). Unlike SLE Abs that commonly bind nuclear structures, 27 of 28 CLL mAbs bound predominantly cytoplasmic and perinuclear structures (18; Figure 1). Only one mAb, CLL255 (IGHV4-59, mutated), reacted with nuclei in a homogeneous pattern that spared nucleoli (see Figure 1). A few mAbs also reacted with nucleoli (data not shown). In several instances, the pattern of binding of members of the same stereotypic subset was similar (for example, cytoskeletal binding pattern of CLL mAbs 114, 657, and 845 of subset 8 (18; see Figure 1). Immunoreactivity patterns of CLL mAbs with intracellular structures of live human cells. Healthy HEp-2 cells were fixed, permeabilized, and exposed to 50 µg/mL of mAbs 114 (A,B), 657 (C), 845 (D), 366 (E), and 255 (F). Binding was detected with FITC-labeled goat anti-human IgG. 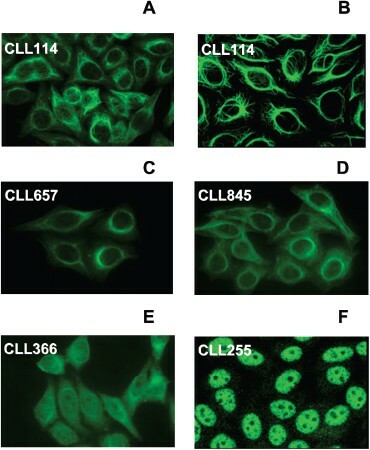 Standard immunofluorescence microscopy images (A,C–F). Confocal microscopy showing mAb 114 binding to fiberlike structures suggestive of cytoskeletal components (B). Studies by Chu et al. indicate that vimentin is the target of this mAb (49). Since apoptotic cells are a source of autoantigens in autoimmune conditions (27), we tested by indirect immunofluorescence reactivity of CLL mAbs with B and T cells after in vitro induction of apoptosis, comparing results with the same cells in the viable state (Table 2; Figure 2). After induction of apoptosis (Table 2; see Figure 2), 18 of 28 mAbs bound surfaces of human B (RAMOS) and T (Jurkat) cell lines. The vast majority were unmutated (16 of 18), although several U-CLL mAbs failed to bind these targets (Nos. 258, 376, and 562). Most unmutated mAbs exhibited antigenic polyreactivity, binding several unrelated (auto)antigens (18; unpublished data). Moreover, of the 2 M-CLL mAbs that bound apoptotic cells (Nos. 154 and 342), 154 had six IGHV mutations, although four were silent and two replacements fell within framework regions. The other cell-reactive mutated mAb (No. 342) showed preferential binding to live B cells (data not shown). aStereotypic subset and mutation status as in Table 1.
bBinding to live HEp-2 cells (subsequently fixed and permeabilized) in arbitrary units based on immunofluorescence intensity. cBinding to apoptotic RAMOS and Jurkat cells by flow cytometry as determined by percent positive events: − = < 2%; + = 2%−5%; + + = 5%−10%; + + + = 10%−15%; + + + + = 15%−20%. dBinding to antigens in ELISA based on signal-to-background ratio: − = < 2; + = 2∓5; + + = 5–10; + + + = 10–15; + + + + = > 15. CLL mAbs bind apoptotic B and T cells. γ-irradiated RAMOS (upper) and Jurkat (lower) B and T cells were exposed under non-permeabilizing conditions to Annexin V-PE and mAbs 014 (A,C) or DO13 (B,D) (50 µg/mL) plus FITC-labeled goat anti-human IgG. CLL mAbs reacted similarly with apoptotic T and B cells from healthy subjects and from CLL patients as well as with apoptotic murine thymocytes (data not shown). This indicated that the autoantigens recognized were conserved across species. During apoptosis, autoantigens can translocate from intracellular compartments to surface membrane blebs and be released as apoptotic bodies (10,11). We set out to determine if CLL mAbs reacted with such structures. Since this question was more conveniently addressed using cells in solution (as opposed to adherent HEp-2 cells), we first determined that CLL mAbs bound intracellular antigens of viable RAMOS B and Jurkat T cells. All CLL mAbs that reacted with apoptotic cell surfaces also bound intracellular targets of these same lymphocytes when viable (Figure 3A–C). Differential binding of CLL mAbs to healthy versus apoptotic cells. (A–C) Viable Jurkat T cells were fixed, permeabilized, and exposed to SYTOX Orange and mAb 114 (50 µg/mL) plus FITC-labeled (Fab′)2 goat anti-human IgG. (D–G) Reacivity of mAb 114 with surfaces of camptothecin-treated Jurkat T cells was anayzed using cells that were not permeabilized and co-stained with SYTOX Orange and Annexin V-Alexa Fluor 647; reactivity with membranes of apoptotic blebs without (H–K) and with (L–O) DNA was determined similarly. Blue: nucleic acid binding by SYTOX Orange; red: membrane Annexin V binding; green: CLL mAb binding; yellow: co-localization of Annexin V and mAb binding. Next, Jurkat T cells were incubated with camptothecin to induce apoptosis, as confirmed by surface membrane binding of Annexin V (Figure 3E,I,M). CLL mAbs reacted with discrete Annexin V+ (AnnV+) surface membrane blebs on apoptotic cells (Figure 3F,G). 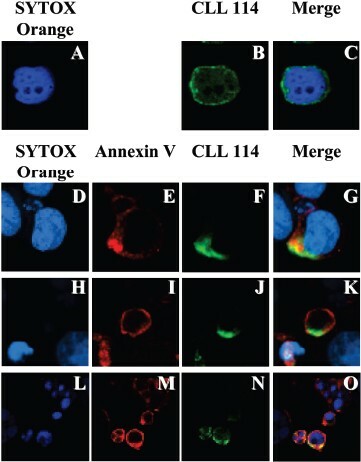 In addition, mAbs reacted with apoptotic bodies (Figure 3H–O) that contained DNA fragments (Figure 3L,O) or not (Figure 3H,K), indicated by presence or absence of SYTOX orange fluorescence (Figure 3D,H,L). Based on the above results, we searched for reactivity of CLL mAbs with clinicallyrelevant autoantigens using a solid phase array (21) containing 65 autoantigens and additional control ligands (Figure 4). No tably, 47 autoantigens displayed significant binding by three or more mAbs. The most commonly recognized self antigen was tubulin, a highly represented specificity of human natural antibodies (28). In addition, significant reactivity was detected with several autoantigens involved in systemic autoimmunity, for example, Sm, Ku, snRNP A, BB′, and C, CENP-B, and others (see Figure 4). Notably, several of these autoantigens localize to apoptotic blebs during apoptosis (27). Hierarchical cluster analysis of autoantigen microarray reactivity of CLL mAbs. Results represent a two-dimensional cluster analysis in which CLL mAbs with similar binding patterns were assigned by computational algorithm to adjacent positions. In the second dimension, a similar computational clustering of antigenic reactivities is shown. 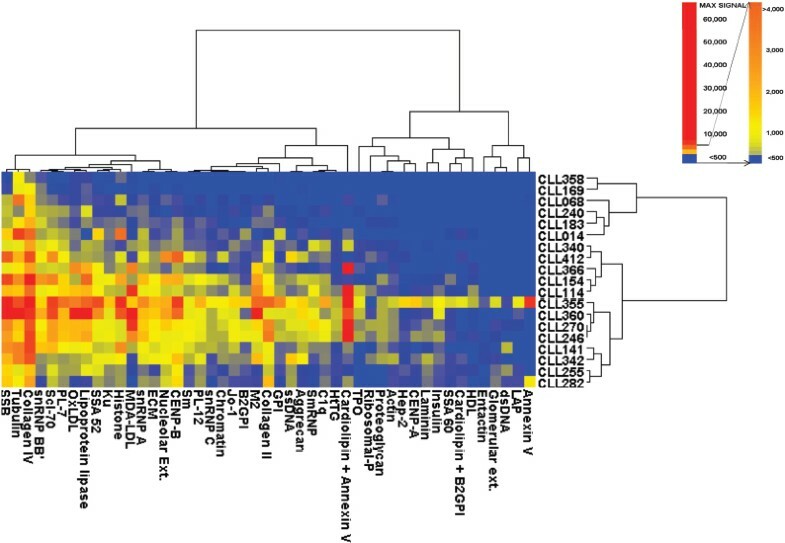 Heat map: bright red represents highest relative antibody activity level; bright blue the absence of relative activity level. Results denote reactivity with antigens bound by ≥ 3 mAbs. In the proteomic arrays, CLL mAbs also displayed high mean reactivity levels with LDL modified by MDA (see Figure 4), a provocative result because apoptotic cells display oxidation-induced neo-epitopes on lipoproteins, lipids, and proteins (12,13), and mice immunized with syngeneic apoptotic cells produce autoantibodies that bind oxidation-induced neo-epitopes (13). Such oxidation-derived neoantigens result from conjugation of metabolites of lipid peroxidation, such as MDA, POVPC, and HNE, to membrane molecules (29). To determine the extent of such reactivities, we tested if CLL mAbs reacted with MDA-, POVPC-, and HNE-modified BSA. 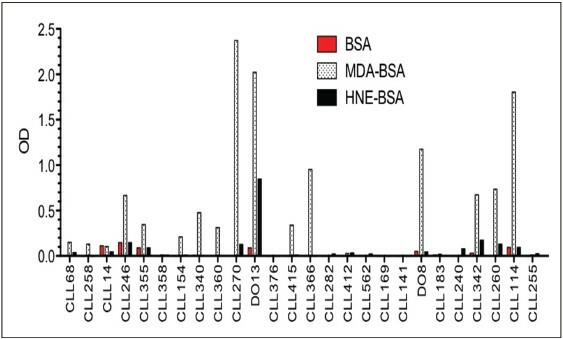 Whereas the 28 CLL mAbs exhibited insignificant binding to native BSA, several mAbs reacted with BSA modified with MDA, HNE (Figure 5; Table 2), and POVPC (Table 2). Reactivity was detected more commonly with MDA-BSA (19 of 28) than with POVPC-BSA (8 of 28) and HNE-BSA (1 of 28); all mAbs binding POVPC and HNE reacted with MDA. As was found for apoptotic cell binding, the most reactive mAbs expressed unmutated IGHV, although some mAbs with mutated IGHV (Nos. 154, 342, and 255) did bind MDA. CLL mAbs bind neoantigens created by oxidation. 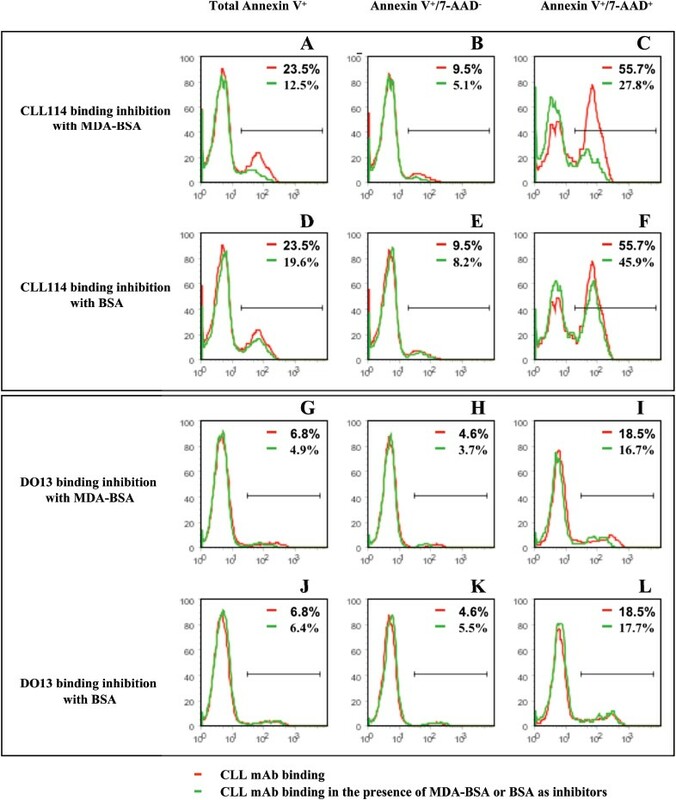 Reactivity of CLL mAbs (25 µg/mL) with oxidation-induced molecular adducts (MDA and HNE) of BSA was tested by ELISA. The polar head group of phosphorylcholine (PC), hidden in the membrane of healthy cells but exposed during apoptosis (12), is an immunologically accessible component of POVPC (30). Therefore, a similar analysis was carried out with PC-BSA (Table 2). Fifteen CLL mAbs bound PC. Comparing mAb binding to PC with that to POVPC, 8 other mAbs bound only PC, whereas 15 others bound MDA. Four MDA-reactive mAbs did not bind PC. Since POVPC can be a component of modified LDL, oxidized LDL also was tested as a target (Table 2). Seven CLL mAbs reacted with oxidized LDL; 5 of the 8 POVPC-reactive mAbs bound oxidized LDL. mAbs 014, DO8, and 225 reacted solely with POVPC; mAbs 270 and 342 reacted with oxidized LDL and not POVPC. To check for a link between CLL mAb binding to apoptotic lymphocytes and to chemically-induced neo-epitopes, we performed an inhibition assay, blocking mAb binding to apoptotic cells with MDA-BSA, the most reactive of the chemically-modified autoantigens. CLL mAb 114 bound 23.5% and DO13 bound 6.8% of apoptotic Jurkat T cells (Figure 6A,G). Both reacted more with cells at later (AnnV+/7-AAD+, 55.7% and 18.5% respectively; Figure 6C,I) than earlier (AnnV+/7-AAD−, 9.5% and 4.6% respectively; Figure 6B,H) stages of apoptosis. Inhibition of CLL mAb binding to apoptotic cells. γ-Irradiated Jurkat T cells were exposed to CLL mAbs 114 or DO13 (25 µg/mL) plus FITC-labeled (Fab′)2 goat anti-IgG. (A–C and G–I) mAb binding without (red) or with (green) MDA-BSA (100 µg/mL). (D–F and J–L) mAb binding without (red) or with (green) native BSA (100 µg/mL). Notably, with four-fold excess of MDA-BSA, reactivity with each dying subpopulation was inhibited ∼30%–50% (Figure 6B,C,H,I). Inhibition was dose dependent (not shown) and specific, since native, unmodified BSA had negligible effects on mAb binding at comparable doses (Figure 6D–F, J–L). Correlation between binding of neodeterminants and apoptotic cells was supported by further comparisons. Of 19 MDA-BSA reactive mAbs, 17 recognized apoptotic lymphocytes; moreover, of 9 that did not react with MDA-BSA, only 1 bound apoptotic cells. Thus a significant correlation (χ2 = 16.33, P = 0.0001; Pearson’s R = 0.764, P < 0.001) existed between MDA-binding and recognition of membrane-associated determinants on cells undergoing apoptosis. Of note, the strongest neoantigen binders displayed the broadest reactivity with targets on the autoantigen microarray (see Figure 4). Next, we looked for correlations between binding domain structure and specific antigenic reactivity. Dendrograms from hierarchical clustering of the proteomic array data showed five major mAb groupings based on antigenic reacivity patterns (see Figure 4). The clustered set with the greatest autoantigen reactivity included CLL mAbs 355, 360, 270, and 246, which all expressed unmutated IGHV1 family genes; these were from two stereotypic sets, subsets 1 and 9 (25,26). These mAbs also displayed significant MDA-BSA reactivity by enzymelinked immunosorbent assay (ELISA). The second most strongly reactive clustered set included mAbs 154, 340, 366, 412, and 114. All of these but mAb 412 displayed reactivity with apoptotic cells and MDA-BSA. Furthermore, all these mAbs except for 412 and 154 were coded by unmutated IGHV. Hence, mAbs with the broadest range of autoantigen binding in the proteomic microarray were the strongest neoantigen binders (see Figure 4; Table 2). The strongest reactivity with apoptotic cells was found for CLL mAbs expressng IGHV1-69 (Table 2). Among these, mAbs belonging to subset 9 (Nos. 014, 246, 355), expressing IGHV1-69/IGHD3-3/IGHJ6 rearrangements, bound more effectively than other IGHV1-69-expressing cases (Table 2). Intriguingly, mAb 366, which also falls into subset 9 based on a IGHD3-3/IGHJ6 rearrangement even though it expresses IGHV3-21 (25), reacted well, but not to the same degree as those subset 9 members using IGHV1-69. This suggests that 1–69 provides an additional binding advantage when co-expressed with this HCDR3. On the other hand, CLL mAb 358 that expresses a mutated IGHV1-69 did not react with apoptotic cells. Furthermore, CLL mAbs 068 and 258, which express IGHV1-69 but belong to subset 6, had diminished apoptotic cell binding compared with subset 9 members (Table 2). Although CLL mAb 068 reacted with apoptotic cells, mAb 258 did not, presumably owing to the few differences in HCDR3 (D→I, position 5 and S→P, position 15) and LCDR3 (1 amino acid longer — G in 258, position 9) structure (Table 1). Most CLL mAbs (excepting Nos. 258, 141, and 255) that bound apoptotic cells also reacted with MDA neoantigens (Table 2), although the degree of reactivity did differ for some mAbs. For instance, IGHV1-69-expressing subset 9 members that reacted well with apoptoticcells were considerably less reactive with MDA, whereas those CLL mAbs with the best MDA reactivity (for example, Nos. 340, 270, DO13, and 360 expressing IGHV1-02 and IGHV1-03, and Nos.114, 657, and 845, expressing IGHV4-39) bound apoptotic cells much less effectively. Furthermore, among MDA-reactive IGHV1-expressing cases, specific IGHV genes, 1-02 and 1-03, appeared more important for binding than the complete IGHV-D-J rearrangements. The 1-02-expressing mAb DO13 reacted more effectively with products of oxidation, in particular MDA, than Nos. 154, 340, and 360, even though these have remarkably similar HCDR3 and LCDR3 amino acid sequences and express identical, un-mutated IGKV1D-39 segments (Tables 1 and 2). Interestingly, mAb 270 had the same high reactivity with MDA as DO13. Since mAb 270 is virtually identical in IGKV-J amino acid sequence to Nos. 154, 340, and 360, the difference in binding to MDA is likely due to changes in HCDR3 sequence, in particular the presence of an extra positively charged residue at the IGHD-J junction in mAb 270 and the loss of a negatively charged residue at the IGHV-D junction in Nos. 154, 340, and 360 (Table 1). This is reminiscent of enhanced autoreactivity in murine SLE mAbs with additional positively charged amino acids in the HCDR3 (31). Finally, the importance of specific IG rearrangements for binding was high lighted by CLL mAbs 114, 657, and 845, which express IGHV4-39/IGHD6-13/IGHJ5 + IGKV1D-39/IGKJ1 rearrangements. These mAbs have virtually identical IGHV (one change at the IGHV-D junction) and similar, albeit not identical HCDR3 amino acid sequences, paired with identical LCDR3s (Table 1). These mAbs reacted similarly with all autoantigens tested (Table 2). The goal of this study was to better understand the role that antigen-smIg interactions might play in the development, progression, and evolution of CLL. Since CLL likely results from transformation of an autoreactive B cell (15–18), we focused on defining both autoantigens relevant to the disease and also a process that yields autoantigens. Our data suggest that CLL mAbs react with autoantigens associated with cellular apoptosis and the associated oxidation of proteins and lipids that occurs naturally during this process. Specifically, we found that most, if not all, CLL cells produce mAbs reactive with intracellular components of several lineages of human cells. These intracellu-lar autoantigens are located predominantly within the cytoplasm (Table 2; see Figure 1; 18), in contrast to disorders such as SLE where autoantigens are mainly nuclear (27). Since apoptotic cells often are targets of autoantibodies in systemic autoimmunity (10,11), we evaluated the ability of CLL mAbs to bind the surfaces of cells undergoing apoptosis. Approximately 60% of CLL mAbs reacted with apoptotic lymphocytes, but not with the same cells in the viable state (see Figure 2; Table 2). These principles are consistent with those recently reported by Lanemo et al. (32). In addition, we tracked relevant apoptosis-associated autoantigens from intracellular locations to surface membrane blebs and apoptotic bodies (see Figure 3). Furthermore, proteomic studies (see Figure 4) indicated that CLL autoantigenic targets can be the same as those in systemic autoimmunity. Both findings suggest a link between the lymphocytes involved in autoimmune diseases and CLL. Autoantigens can also be created de novo during apoptotic death. Consistent with this possibility, we (Table 2; see Figure 5) found significant reactivity of CLL mAbs with metabolites of lipid peroxidation, as did others (32),. Therefore, a central role for apoptosis in selecting and expanding CLL cells and their precursors is likely, since oxidation is linked to apoptosis (12,13). Binding of CLL mAbs to apoptotic cells could be inhibited partially (∼30 to 50%) by pre-incubation with MDA-BSA (see Figure 6), suggesting that epitopes on apoptotic cells and chemically-modified molecules could be similar structurally. Alternatively, a single paratope conformation could interact with both native and modified autoantigens (33). However, since the inhibition with MDA-BSA was not complete, either the mAbs react with unmodified self-antigens or with distinct neoantigens created by other chemical modifications occurring during apoptosis. The latter is reinforced by the findings that some mAbs, especially those with unmutated IGHV1-69, are more reactive with oxidation adducts than apoptotic cells, and that other mAbs of the IGHV1 family (1-02 and 1-03) react oppositely (Table 2). In general, CLL mAbs with the greatest autoreactivity were polyreactive and not mutated somatically (Table 2). However, some unmutated mAbs failed to bind the targets (Nos. 258, 376, and 562), indicating that lack of somatic mutation alone did not necessarily confer autoantigen binding activity. Conversely, a few M-CLL mAbs did react (Nos. 154 and 342). Comparing autoantigenic reactivities with mAb structure, it is clear that specific IGLV family and gene use, rearrangements, and particular IGH-IGL chain pairings influence binding, as has been noted (34). Furthermore, unique residues within HCDR3 appear to augment autoreactivity, as in experimental systems (31). Despite the dramatic skewing of IgH and IgL V gene use and association, and the resulting remarkably similar in H and L CDR3s and overall mAb structure, in some in stances even limited amino acid differences altered patterns of antigen binding (Tables 1 and 2). How do these observations relate to the development and evolution of CLL? The normal pre-immune repertoire is enriched in antibodies reactive with the types of epitopes tested. These natural antibodies serve housekeeping functions such as clearance of cellular debris and products of normal catabolism. They also represent the humoral arm of innate-like B-cell immune responses, providing a first-line of defense against blood-borne pathogens (35). This principle is embodied in the murine TEPC15 (T15) mAb, which expresses a canonical V gene rearrangement that recognizes PC, a component of bacterial cell walls, and protects against lethal sepsis in animal models (35). PC is also a component of mammalian cell membranes that is exposed during apoptotic death (30). Since T15 and its IgM equivalent, EO6, can bind oxidation-induced epitopes and apoptotic cells (30), reactivity with phospholipid-derived epitopes, catabolic byproducts, and microbes are linked. In this regard, we have shown that several of the CLL mAbs that bind apoptotic cells, neo-determinants, and PC react with bacteria (36). Collectively, these findings may relate to the development of CLL shortly after bacterial pulmonary infections (37). Our findings also may have implications for understanding the normal cellular precursors of CLL cells. T15-related mAbs arise primarily from the murine B-1 cell (CD5+) compartment (14). Similarly, CLL cells, or at least those with unmutated IGHV, could arise from a human B-1 equivalent. This subset has not been identified in man, although data suggest there is a human analog (38). However, most circulating CD5+ human B cells are not representative of a human B-1 equivalent since they lack the poly/autoreactivity that is the hallmark of CLL (18). Alternatively, CLL cells could emanate from marginal zone (MZ) B cells, a subset with features and properties linked to B-1 cells (39). MZ B cells in mice display autoreactive smIgs (40), some of which lack allelic exclusion (41), as do some CLL cells (42). Derivation from an MZ B cell is also consistent with gene expression studies, suggesting that U-CLL and M-CLL cells arise from the same precursor (43,44). In this regard, it is intriguing that some CD5+ B cells reside in the subepithelial spaces of tonsillar crypts, a human MZ-equivalent (45). Finally, our findings may help clarify mechanisms of clonal expansion in CLL. B cells can recognize and respond to apoptosis-associated antigens not only through smIgs but also via Toll-like receptors (TLRs), which interact with mi-crobial pathogen-associated molecular patterns (46). Since certain TLRs in B cells are located within endosomal compartments, stimulatory ligands must gain entrance to endosomes via cell surface receptors; smIg can provide this entrance (47). Indeed, in systemic autoimmunity, smIg capturing autoantigens that contain DNA and RNA, the stimulatory ligands for TLRs 9 and 7, respectively, and delivering these to intracellular TLRs can propagate autoimmune responses (48). Several polyreactive CLL mAbs react with DNA (15–18) and RNA-protein complexes (see Figure 4) that translocate to apoptotic membranes (10,11,27). In addition, non-muscle myosin heavy chain IIA (49) and vimentin (32,49), proteins that also translocate to the surface of apoptotic cells (50–52) often in association with DNA (53), are targets of CLL mAbs. Therefore, since CLL smIgs bind DNA and RNA directly or complexed with native or modified molecules, they could capture such nucleic acids from apoptotic membranes and blebs (see Figure 2) and deliver them to endosomes to enable stimulatory interactions with TLRs 9 and 7. Thus, smIg and endosomal TLR co-signaling could enhance CLL cell survival, expansion, and evolution, and thereby influence a patient’s clinical course and outcome. We appreciate the statistical help of Peter A Clement, Bull Information Systems, Chelmsford, Massachusetts, United States of America. Studies were funded in part by CA87956 (National Cancer Institute) and RR018535 (National Center for Research Resources). The Karches Foundation, Peter Jay Sharp Foundation, Prince Foundation, Marks Foundation, Jean Walton Fund for Lymphoma and Myeloma Research, and Joseph Eletto Leukemia Research Fund also provided support.